Mexican Bus Information on Tufesa, TAP, TBC, Estrellas del Pacifico and Mayitos. 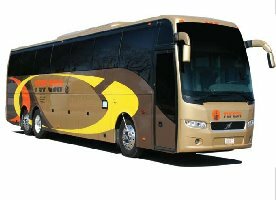 Taking a Tufesa bus from Arizona to Guaymas is convenient, comfortable, cost-effective and easy to use. You can reach Guaymas with Tufesa from numerous points in the US, inlcuding Phoenix, Tucson, Las Vegas and Las Angeles. Once in Guaymas, you can take a 20 minutes cab ride to San Carlos (about 250 pesos). There are cabs right outside the bus station. Transportes y Autobuses del Pacifico (TAP). TBC Bus Lines has service from Guaymas to Phoenix and Tucson.